On Monday, I insisted I’d be cutting back on videos this season. Instead, here’s my sixth of the opening week. 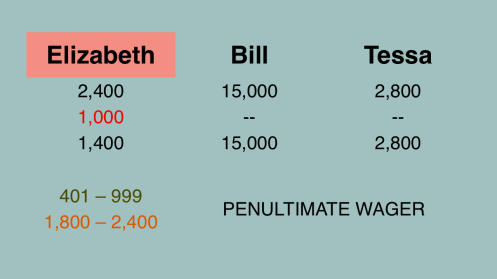 In the video, I’ll discuss the three Penultimate Wagers that happened this week. Click on the relevant image to jump to my discussion. Defending champ Elizabeth Williams got a Daily Double on the final clue in Double Jeopardy! – our first Penultimate Wager of the season. In his third game, Bill Cossen had the lead – and the last Daily Double – late in the round. To cap our week, Stephanie Bilyeu finally won a buzzer race, and took full advantage of the Daily Double – perhaps a bit too full. I like to focus on process, but for those of you obsessed with outcome: based on what transpired, none of this would have changed the ultimate result of any game this week. In Friday’s game I think a 4,000 wager (leaving her with 400 if wrong) is even better than your 4,200 (with 200 left) one. 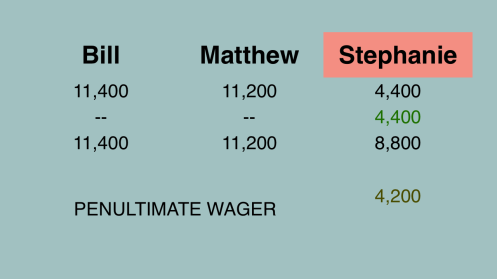 That’s the next “breakpoint” in the three-player match, but that’s even better since Stephanie can then bet zero and have a shot with a tie-offering Bill (which likewise here is also in his best interests) if everyone’s wrong (instead of having to be the only one right with your suggestion). 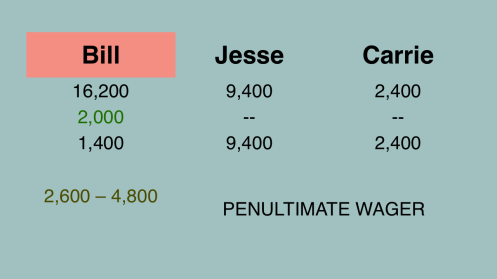 I can see a justification for Bill’s 2,000 wager, because no more than 2,100 (assuming those clues never get shown or are unanswered) means he’ll have at least 1.5 times that of Jesse forcing him to get Final right to win (in fact I think for a “small” bet exactly 2,100 would’ve been best since that also opens the door to winning if he’s wrong and Jesse’s right if Jesse bets nothing, which is one of two ideal wagers when trailing in an exact 2/3 game when third can’t catch you). Of course your idea of 2,600 to 4,800 is just as good since that gives him a lock if right.